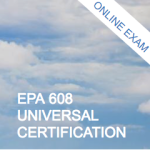 This EPA 608 Technician Certification Online Exam package includes the exam proctoring fees for the EPA-approved tests for Section 608 Technician Certification, in compliance with the Clean Air Act. Technicians who perform maintenance, repairs, or disposal of appliances that contain regulated refrigerants must be certified. There are different types of certifications and corresponding testing requirements based on the type of equipment the technician will be working with. Click on the event details below to learn more about the different Certification Types. Individuals can register for this exam package to take the Universal Certification Exam including the CORE, Type I, Type II, and Type III sections - all proctored online! If you are interested in attending a preparatory class AND taking the certification exam, click here to view our EPA 608 Technician Certification prep course.